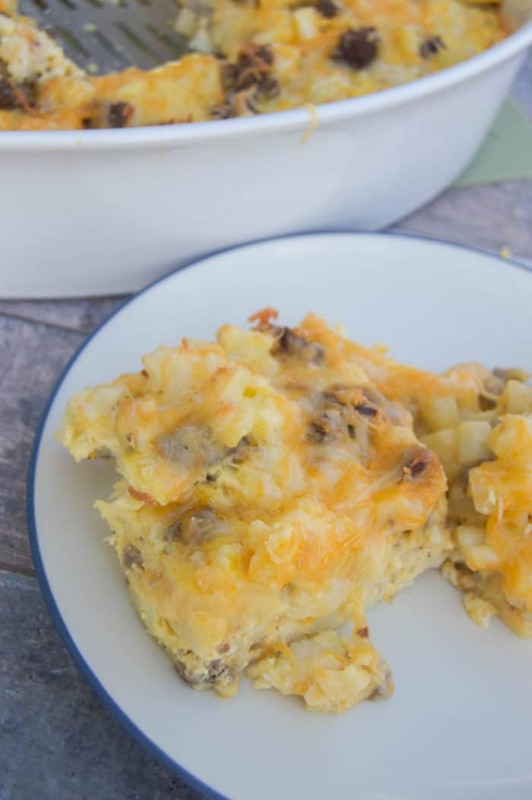 This Cheesy Potato Breakfast Casserole is so simple and easy to make! The perfect breakfast casserole recipe loaded with cheese! 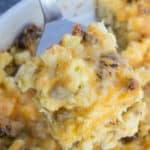 Breakfast casseroles are one of my favorites! I love that I can get most of it ready the night before and just pop it in the oven in the morning. 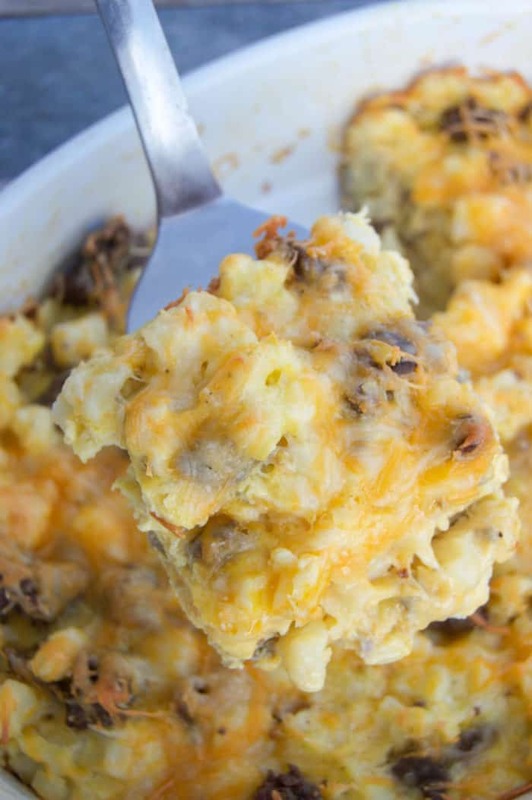 Not to mention this Cheesy Potato Breakfast Casserole makes the perfect breakfast for dinner. 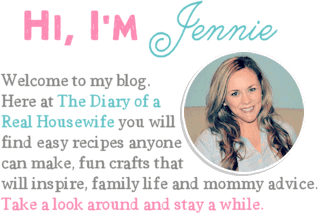 I think I talk about breakfast for dinner in just about every breakfast recipe I write. Between this and my low carb breakfast casserole, I could have breakfast dinner several times a week! This breakfast casserole is so simple and such n easy recipe to make. 4 ingredients plus seasoning and then tossed in the oven to bake, doesn’t get much more simple than that. For this recipe start by cooking your breakfast sausage, draining, and setting it aside for later. Whisk your eggs together with some salt and pepper then everything goes in a casserole dish. Lots of cheese, 2 cups in and a 1/2 cup on top! If you are making this ahead then stop right here. Wrap it up and stick it in the fridge until morning. Otherwise, pop it in the oven for just under an hour and then it’s ready! Another favorite thing about breakfast casseroles, the leftovers! I had some this morning, and they taste just as good as the day I made it! 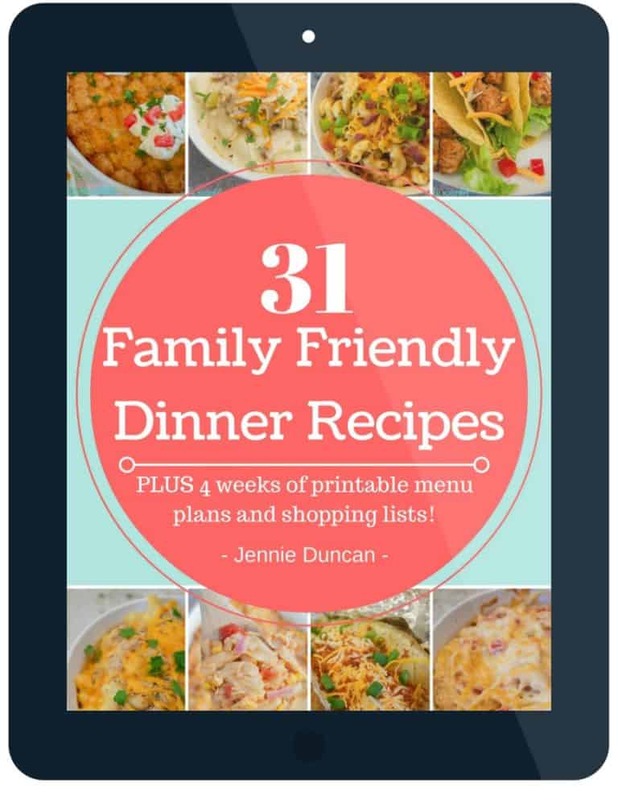 Preheat oven to 350 degrees F. Prepare a casserole dish with non-stick cooking spray and set aside. Cook and crumble ground breakfast sausage until fully cooked. Drain fat and set aside. Place hash browns in your casserole dish. In a separate bowl whisk together eggs, salt, and pepper. Pour eggs and 2 cups shredded cheese into casserole dish and mix well until all potatoes are coated. Top with remaining 1/2 cup cheese and bake for 40-50 minutes until eggs have fully cooked. Serve and enjoy!